Very beautiful. So if you use it as a pollen parent does it pass on the striping. Hi Paul, she is a beauty. You will sell tons of them! Can you tell me what new propagation ideas you have. I find it all quite interesting. My theory is that one might be able to force a sport to become inheritable by forcing the secondary axillary buds to form and pollinating from flowers formed on these stems. If you were to lop off a branch or two so that no buds remain this would force the dormant secondary axillary buds around the base of the severed stem to grow and from what I've read there is a chance the sported genes can jump tissue layers and actually contribute to the formation of gametes. Then take the pollen from the new branches that form and see if it passes on the stripes by pollinating something reliable. 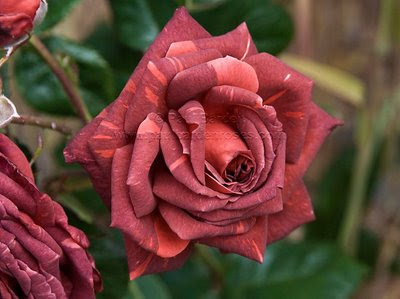 I'm going to try this little experiment myself with 'Burgundy Iceberg' in the coming season. It's a pain though as nothing seems willing to accept BI's pollen and it is such a dud here as far as disease resistance goes that and I want to shovel prune it instead. One of the nicest looking stripes I have seen! Please let me know if you introduce it. Big fan of coffee colored roses and stripes. Really like it; striking but subtle at the same time. Has a richness to it, not cheap or flashy. Go for it!!!! What a neat color! Very unusual. Kind of a brick red shade. Good luck on replicating it!